Kathleen T. McWhorter is professor emerita of humanities and former director of the Learning Skills Center at Niagara County Community College. She has also been on the faculty of the State University College at Buffalo. She is the author of a number of books on writing for freshmen-level students, including the popular guide Successful College Writing, Sixth Edition (Bedford/St. 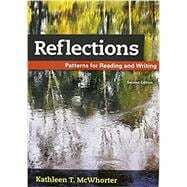 Martin’s, 2015), and the composition reader Reflections: Patterns for Reading and Writing (Bedford/St. Martin’s, 2013). She has also written a number of textbooks on reading and writing for developmental students, including In Concert: Reading and Writing, Second Edition (2016); In Harmony: Reading and Writing, Second Edition (2016); Reading Across the Disciplines: College Reading and Beyond, Sixth Edition (2015); Academic Reading, Eighth Edition (2014); and Efficient and Flexible Reading, Tenth Edition (2014).